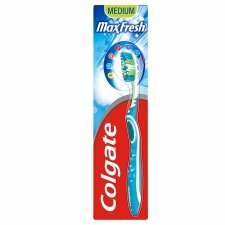 Enjoy cleaner teeth and fresher breath with the Max Fresh toothbrush from Colgate. This innovative, whole-mouth clean toothbrush has multi height and angled bristles to get deep between the teeth and along the gum line. On the back of the brush head is a rubber tongue cleaner that can be used to remove the odour-causing bacteria that causes bad breath. A textured handle with wide thumb grip ensures the Max Fresh toothbrush is comfortable to use. Dental professionals recommend tongue cleaning as an important part of your daily oral care regimen.